TORONTO – We are in the midst of a new era of urbanization. According to the United Nations, two-thirds of the world will live in cities by 2050. Policymakers have begun to face the economic and environmental consequences of this mass urbanization, but what are the implications for human health and mental well-being? Professor Nikolas Rose is an international expert on the impact of living in cities on mental health and well-being and the neurosocial city. 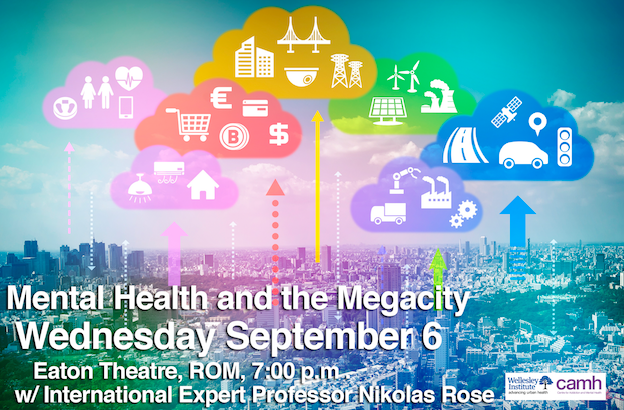 He is coming to Toronto September 6th to share his work looking at mental health and the megacity and what policymakers can do to produce cities that make us well and help us to thrive. On the panel with Professor Rose are Elliott Cappell, Chief Resilience Officer for the City of Toronto and Dr. Kwame McKenzie, CEO of Wellesley Institute, and an international expert on the social causes of illness, suicide and the development of effective, equitable health systems. This event is co-sponsored with Centre for Addiction and Mental Health and Wellesley Institute. Professor Rose will be speaking in the evening of September 6th at the Eaton Theatre in the Royal Ontario Museum. Professor Rose will be available September 6th for radio. Dr. Kwame McKenzie will be available September 5th & 6th for radio. Please inquire for print availability.